I was recently having a chat with a few friends (disclosure: we’re all single). The conversation pranced around from our favourite dating apps of the moment, first date horror stories and loitered around the concept of selecting a perfect date venue. “I’m so sick and tired of coffee. If I want to spend 5 dollars it’s not on a latte I can make at home easy peasy. I’ll throw my dollars down on two scoops of ice cream at Baskin Robins,” I chirped. Half of the crowd were appalled (the gays, those calories) while the others (fierce females) were delighted by the concept of getting to know someone through their scoop selection. I mean do you really feel as though you’re going to marry someone who orders three scoops of vanilla? I’ve learned I don’t typically swoon for boys who get excited about sorbet or sherbet. I’m more of a mint chocolate chip, pralines n’ cream and peanut butter chocolate sort of guy. Now ya’ll know the key to my heart. Thankfully Toronto has an endless selection of date friendly venues. If you find yourself on a lame date it’s not the city that let you down it’s the imagination of the girl or boy sitting across from you. 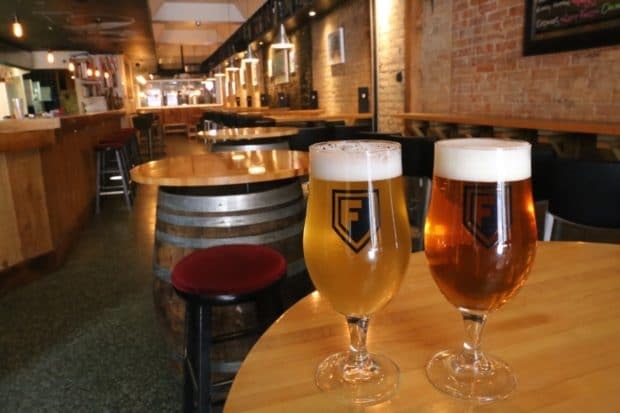 While ice cream romance will always fill my summer with glee, at the moment I’m falling head over heels for Toronto’s most recent crop of craft breweries. Long gone are the days where smitten sud-splashers have to hop on a group tour of a brewhouse – leave your hops and barely teaching moments at home please! I recently took it upon myself to slurp my way through the city’s most buzzed about craft breweries and found five spots that offer a lot more than just a tour, tasting and bottle shop. Next time you’re looking for love be sure to check out a local craft brewery and you’ll be sure to find funky interiors, pretty patio, top notch culinary creations and live music…perfect for dancing those pretty pints off with a 1, 2 and a 3. Head to Toronto’s Polish neighbourhood and slurp through a few pints on pretty patio or vintage furniture adorned dinning room at Bandit Brewery. 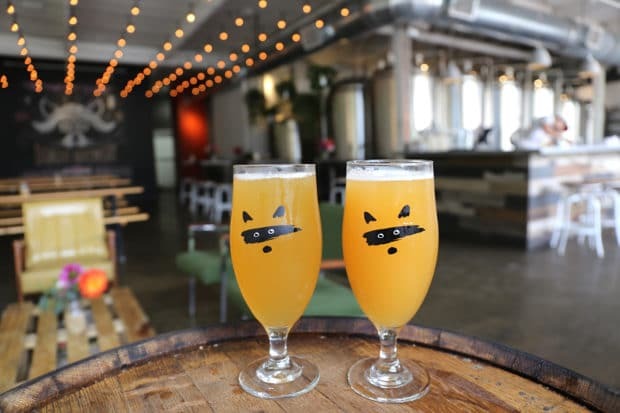 The city’s bemoaned mascot (the racoon) winks from all directions as beer fans slurp through any of the 20 beers on tap with favourites including Ring Tail Session Ale and The Hassel-Hef. Best bets for munchies include Beer-Battered Cheese Curds (omg), oven fresh Pretzels dipped in sweet grainy mustard and Sticky Toffee Pudding. Hop off the subway at Bloor and Dufferin and you’ll find a multi-faceted approached at Burdock Brewery. A perfect playground for adults, Burdock features a pretty patio perfect for people watching, fine dinning out front, brewery and bottle shop out back and music hall featuring performances by such luminaries as ZUZE, Moonheart with Blessings and Snowblink. 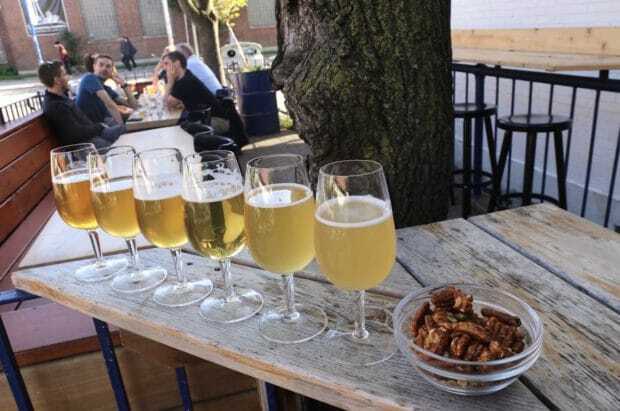 Be sure to sample through a flight of Burdock’s stellar beers (Pear Berliner, Session Saison and Brett Farmhouse FTW) while nibbling through crispy Berkshire Pork Belly, Lamb Andouille Sausage and Chimi Churi’d Bavette. 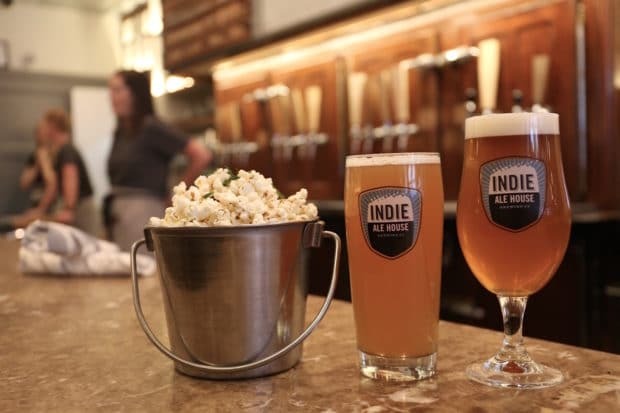 Head to the city’s brightest up-and-coming neighbourhood and dive in for a sud-stache at Indie Ale House. The brewpub is now a hallmark in The Junction, quickly becoming a community watering hole for local foodies. I hop up at the bar and instantly am impressed by the diverse crowd: a table of lady friends sipping suds with their toddlers in toe, a few plaid shirt wrapped bros nibbling on BBQ ribs, a gaggle of girls celebrating TGIF and a flock of families tucking in to a fine feast. The kitchen prepares a trilogy of popcorn (old cheddar, garlic butter and rosemary is a fav) perfect for munching while hydrating on hoppy. Smack dab in the middle of the hip Ossington strip sits Bellwoods Brewery. The city was abuzz when it first opened its doors in April 2012 and Instagram fans rejoiced, snapping photos of their bright beers while sitting on the breweries now iconic white picket fence wrapped patio. 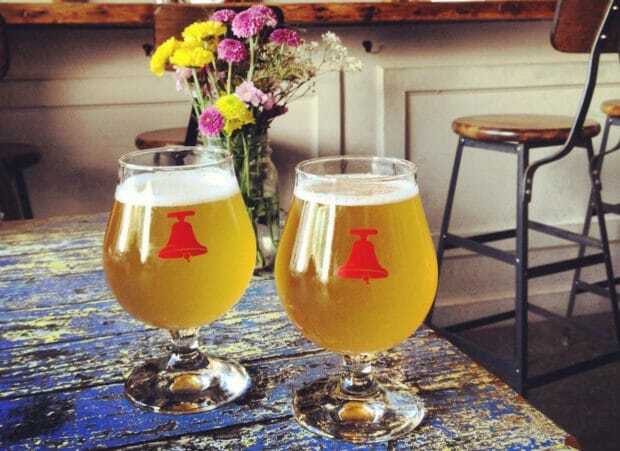 A short hop, skip and a jump from Toronto’s beloved Trinity Bellwoods Park, Ossington only brewery offers a perfect spot to sip after a successful Queen West window shopping romance. It’s a perfect spot to people watch while snacking on Duck Meatballs, Albacore Tuna Civeche and Falafel Lettuce Wraps. Take a peddle through Little Italy and enjoy a pause over a fresh pint at Folly Brewpub. The folks at Folly brew small batches and barrels of beer focussing on farmhouse and mixed fermentation ales. You’ll find a wee bottle shop out front and a cozy pub and beer bar which also features one of the city’s largest collections of whiskey. The plates that parade out of the kitchen immediately impress. You’ll find finger-licking-good fun beautifully presented as Grilled Carrot Salad spiced with dukha, crunchy Smash & Fried Potatoes topped with bacon, cheese sauce and sour cream and epic BBQ Pulled Pork Nachos adorned with smooth avocado crema.